Iranian Satellite Launch Fails The rocket was supposed to carry a small satellite into orbit. The suspected failure comes just weeks after another launch attempt fell short. These satellite images show a circular launchpad for the Safir rocket at the Imam Khomeini Space Center in Iran. 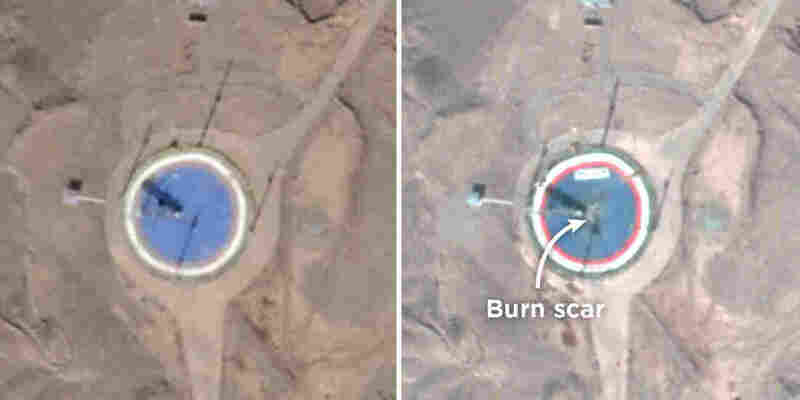 The image on the right, taken on Feb. 6, shows a burn scar. The image on the left, from Jan. 21, does not. "We seem to see at least some scorch marks on the launchpad, indicating that a launch likely happened," says David Schmerler, a senior research associate at the Middlebury Institute of International Studies, who has analyzed the imagery. The burn scars on the launchpad indicate that the rocket took off successfully, Schmerler says. But Iran has made no public announcements regarding the launch, and Schmerler and others believe something went wrong later in the flight. "It looks like it went up and probably just failed to insert the satellite into orbit," he says. This would be the second attempted space launch by Iran in less than a month. On Jan. 15, Iran attempted to launch a satellite, built by an Iranian university, aboard a large rocket known as the Simorgh. In a speech several days after the launch, President Trump warned that Iran's space launch program could help the country "pursue intercontinental ballistic missile capability." Schmerler says the rocket used in this latest launch attempt is probably smaller than the one used in January. Known as a Safir, it is a two-stage liquid-fueled rocket based on missile technology the Iranians obtained from the North Koreans. But Schmerler and others say the ties between intercontinental ballistic missiles and Iran's space program are tenuous. Iran's space-launching rockets are not designed to lob warheads at faraway targets, and the technology used in the rockets means they take time to set up and launch. That makes them poor weapons. "The ballistic missiles and space launch vehicles, while they look very similar, are also very different in what they're designed to do and how they're designed to reflect that specific task," he says. Michael Elleman, a physicist and senior fellow for missile defense at the International Institute for Strategic Studies, says this would be the fifth time that a Safir rocket failed since its first launch attempt in 2008. Four other Safir launches were successful. The imagery suggests to Elleman that the rocket flew for a while before failing. "The scorch marks and lack of apparent crash adjacent to the pad suggest it made it at least 10 seconds, if not longer into flight," Elleman said in an email. "Whether the first or second stage failed, we cannot judge without additional information." Schmerler believes that despite the back-to-back failures, Iran will attempt another launch. "It's trial and error," he says. "And eventually they're going to get it right."